This introductory level chemistry set teaches concepts of basic chemical structure and molecular bonding with multi–colored atoms and links. 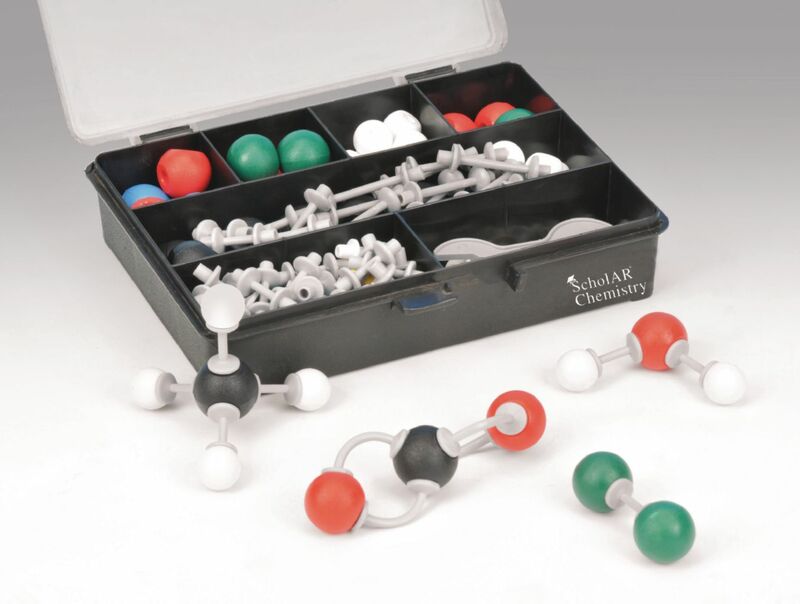 Combine 53 colored elements including carbon, oxygen, hydrogen, nitrogen, sulfur, and halogen to create a variety of molecules using short and medium–length links. Includes: fourteen 22 mm black carbon, eight 20 mm red oxygen, twenty-two 15 mm white hydrogen, two 22 mm blue nitrogen, one yellow 22 mm sulfur, six green 20 mm halogen, twenty-eight medium gray links, twenty-six short white links, twelve long flexible gray links, and one Link Remover Tool.